Either I’m in a good mood today, or this book has no cons! OMG. THE WRITING STYLE IS AMAZING!!! But I won’t say anything else in this paragraph, because I will mention it lower down! But… It was just so sophisticated and elegant! JUST AMAZING! Nothing quite like it! I loved how we saw so many different sides to the different characters! But sometimes I did find it a little confusing, about what the character was actually like (such as Peter; I didn’t understand whether he was actually good or bad… because he gave that evil speech at the beginning about how he was going to kill Ender and maybe Valentine… but then later that day, he whispered to Ender that he loved him… So it confused me a bit…, but it was good, because in general, people are confusing… and it just made him seem like more of a 3D character). I loved how Peter contrasted Valentine, and how Ender was just in the middle! They were just all so different, but at the same time, so similar to each other! They all longed for power and control, but they had different methods at getting to it. Ender: He deserves his own little paragraph! He was just such a three dimensional character! There were so many sides of him, and new ones kept appearing. He is just awesome! It’s hard to imagine that he is actually a kid, just like you and me, when he is like another race. I loved the how Orson Scott Card set out the chapters!!! In the first part, it was written about the teachers and what they are saying and feeling, and as “there is no teacher but the enemy” they kept giving hints about what was to come, later in the chapter! After that part, comes the main part; e.g. 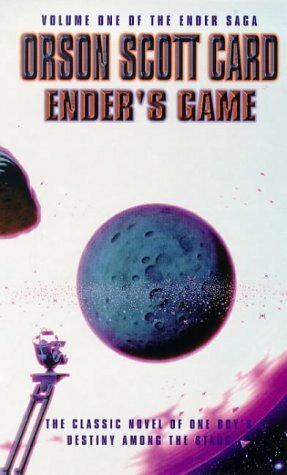 About Ender, or Valentine, etc. If you have read this book, you might be wondering, who is this reviewer writing about? Well, as I believe that the buggers aren’t the read villain, I think that the real bad guys were the teachers… They were just so sly… and so evil… Even the good teacher was evil… 😦 Although he actually cared about Ender, he still let those things happen to him, which almost makes it worse… because he knows that it is wrong… but he doesn’t try to stop it from happening. I just think that those teachers are written so well! and that it was subtle, that there was actually no enemy or villain, and that the reader could choose for himself/ herself who he/she believed the villain was! It was a really good concept. I was surprised that I haven’t read a book like that before. Just to let you know, the concept that I liked is that it is the kids who are really in control! and that they aren’t normal kids; they are really exceptional! If you are one of those people who skip to the end of a book or review, just to read the last few lines said this next sentence is a summary about how this review went: OMG! IT’S AMAZING! The writing style is FANTASTIC!, etc. You get the picture! So how can I write a review that positive, and not give the book 5 shurikin stars? The answer is that I can’t! 5 SHURIKIN STARS!!! No doubt about it! I would highly recommend this book, and I will let you know my thoughts after I have read the second! And for Jane… I can’t believe she just replaced Ender… :(Ender is awesome…. Both books are pretty awesome! Did you hear, there’s going to be an Ender’s Game movie in 2013 I think! I was so angry at ender though when he lost Jane in Speaker for the Dead. And the sad thing is; it’s not an exaggeration.